Are you concerned about the toxins, chemicals and hormones that surround us every day? Are you also looking for ways to be a better consumer and find eco-friendly alternatives in your home? One area I think we can all make a big impact in is the kitchen. The food we eat, the tools we use and the way we clean. Years before I became a mom, I did a pretty good job of being ‘green’ as they say. I used natural products and was extremely aware of where all of my food was coming from. Now that I have a family, I want to make this even more of a priority. The problem: When there are more people to feed and expenses are higher it can be a little more difficult to be green. Let’s face it, organic and all natural products cost more. As moms, we have less time and are looking for easy ways to keep on top of dinners, mess and life! 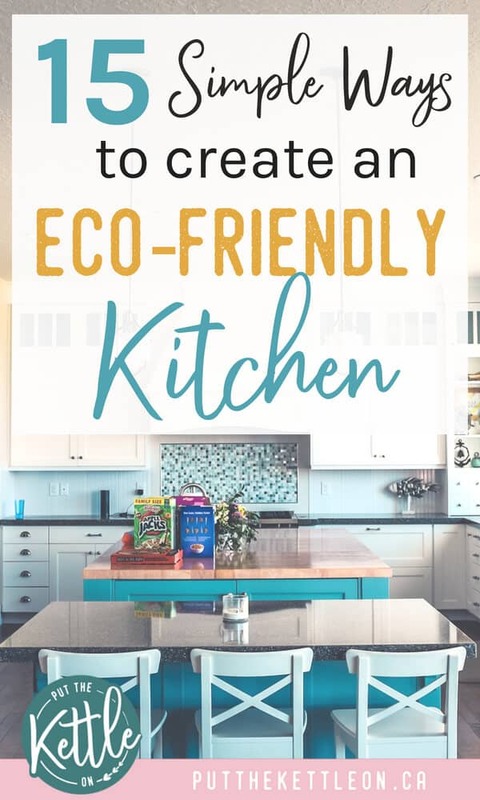 Saying all of this, the kitchen is an important place to start when it comes to making your home more eco-friendly. Making thoughtful decisions impacts the health of our families and the health of our planet, which is why it’s so important to be conscious about making some important changes. Here are 15 ways to ‘Go Green’ in your kitchen, starting now! This means you must be aware of the packaging you are using when going to the grocery store. 1. Buy produce with no packaging, if possible. If you have the choice to buy peppers that are wrapped in plastic vs. peppers that are not, so for the package free option. The same goes for any packaging – if you can buy a product with no packaging this is best. 2. Don’t use plastic bags at the store, instead bring your own bags. You can purchase bags from your grocer and use eco-friendly mesh produce bags for your fruits and veg. These mesh bags are fantastic and also come with a swaddle sheet to keep veg fresh for longer in the fridge. 3. Buy in bulk, which is great for your wallet and the environment. Also, ask your local bulk food store about bring your own containers. As always try and go for plastic-free containers. 4. Eat less red meat. Did you know that methane gas is one of the biggest causes of pollution on our planet? Well, methane gas is gas from belching cows! Eating less red meat means there won’t be as much of a demand on reproducing more and more cows. This means reduced methane gas. It’s really a simple math equation! By the way – ask your kids what they think the biggest polluters in the world are and they’ll be shocked about cows! 5. 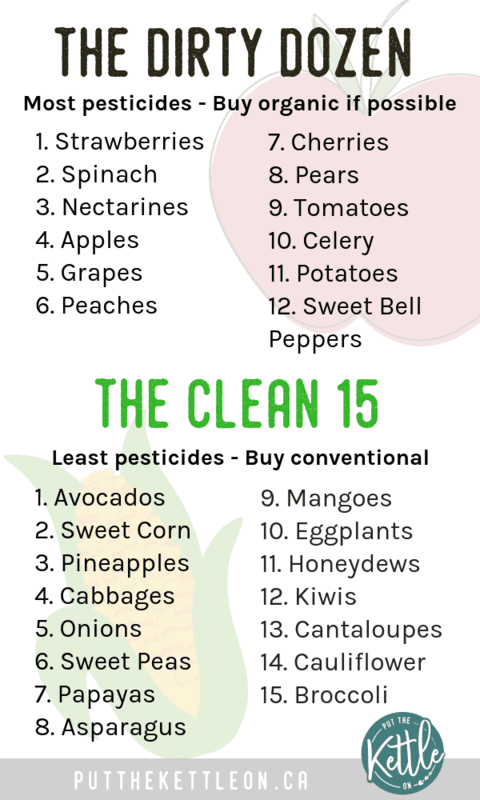 Have you heard of the Dirty Dozen and the Clean 15? Organic produce can be expensive, so it’s important to understand which fruits and vegetables have the most pesticide residue and which have the least. As consumers, we can then decide which produce to buy. 6. If you can afford to buy organic chicken go for it, but if not try and get ‘hormone free’ and ‘humanely raised’ chicken. I read a book called Eating Animals a few years ago and I’ve never looked at chicken the same way again. This book is eye-opening to say the least, but a must read to be a conscious shopper and have a clear mind. You can pick up the book here. 7. Go to farmer’s markets. This way you are supporting local growers and not the larger food industry shipping produce from 1000 miles away. Just keep the dirty dozen and clean 15 list in mind even at the farmer’s markets. You can also ask the local growers if they use pesticides. Many farmers actually run organic farms, but they can’t call it that as it’s not officially ‘certified’. 8. Who doesn’t love glass jars and containers? Well, it’s time to get rid of your plastic and replace with mason jars and glass airtight storage containers. You can also reuse glass pasta sauce jars and all other glass jars you might be thinking of disposing. In the US 500 Million straws are used every day. It takes up to 200 years for a straw to decompose. Every year, 1 million seabirds and 100,000 marine animals die from plastic ingestion. 10. Use natural dishwashing soap and dishwasher tabs. This is important so you are not adding toxins and chemicals to your dishes. Makes sense right?! 11. Make Your own all-purpose cleaner. Here is a great DIY recipe from a blogger I love: DIY All-Purpose Cleaner. 12. Reduce paper towel use and ultimately give it up. I agree this is a hard one, however, it’s easy to replace paper towel with cloth napkins and use tea towels for your spills. S’Well Vacuum Insulated Double Wall Stainless Steel Bottle – These come in so many cool colours and patterns, but the best part is they keep hot drinks hot for 12 hours and cold drinks cold for 24. S’ip by S’well Vacuum Insulated Double Wall Stainless Steel Water Bottle – Made by the same company as above but these bottles are a little smaller, so perfect for kids too. 14. Never, I repeat, never use plastic cutlery! Put proper steel cutlery in your kids lunch bags. If you are concerned they will lose all your cutlery, you can go for this compostable cutlery. Also, if you are ordering food delivery to eat at home, ask them not to include cutlery. Last, but not least Recycle! 15. Understand what can be recycled and how to do it properly. Recycling may seem obvious, but I think at some point we are all doing it wrong. There are items that have the recycling symbol on them, but your city might not recycle that item, so it’s best to check your local city rules around recycling and then stick to those rules. Also, make sure that all containers are food free. Tell me: What do you think is the hardest thing about being green in the kitchen? Also, what are you working on to be greener in your kitchen and home? Found this post helpful? Please share! Hi Yolanda, This is a great comprehensive list. Now being a mom I am more aware of chemicals and bad foods. Recently, I wrote an article on essential oils and replacing your cleaning products was very helpful. You and your readers might find this helpful as well. I will share your article with my audience. Yes to all of these awesome ideas! It’s amazing how some simple changes can make a HUGE difference, for us and the environment 😊. Thank you for sharing all of your amazing advice! Hey Sara! So true, even the smallest of changes makes a big impact in so many ways! Glad you’ll keep them in mind 🙂 Being aware is the first step to change! Happy you find the list helpful too. Thanks Sarah. We have done many of the things on your list but haven’t made it to farmer’s markets yet. That’s next on my list! Fabulous post, this! We do try and do our best, eating local and organic as much as we can. There’s always more that can be done though. Awesome! I started making small adjustments in order start the process. I’ve been making my own cleaning products and I can tell the different. Everything looks so bright and smells so fresh. I need to find farmer’s markets – I’m finding that the cost of items at the grocery store are astronomically high and these items arent the best of the best. Great Post – I love it! Hi Shatoria 🙂 Thanks for the note! So true, depending on the grocery store, the cost of produce can be astronomical. Definitely try and shop for what’s on sale. Making your own cleaning products is so amazing too and this is where you can also save great $$. We live on a farm and grow most of our own food. Our neighbor raises cattle naturally not in a confinement and you would never know he has cattle. We try to be as green as possible. I learned about the dirty dozen and clean 15 this past year. My nanny family had the list on their fridge. That’s very helpful info! Love it love it. 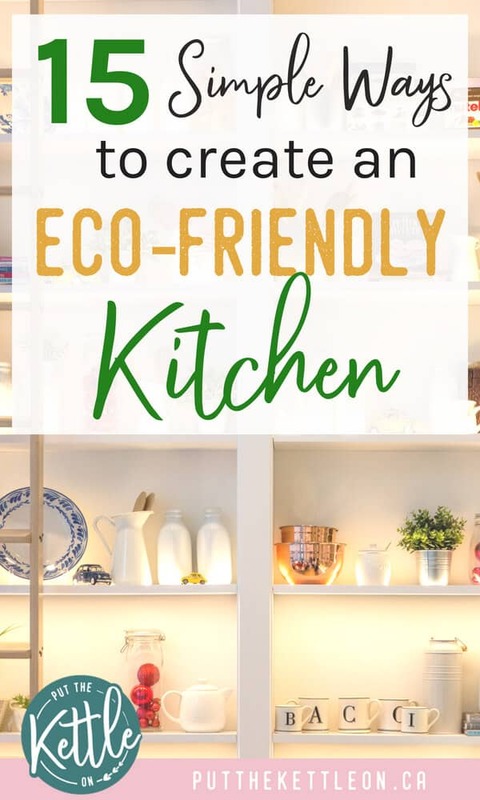 Was thinking about making my kitchen more green friendly but did not really know where to start… after reading your post, started straight away!!! Thank you!!! Hi Yasmina – That’s great to hear. The smallest of changes can actually make a great impact 🙂 Have fun! Great tips! I probably follow a third of this list. I have been wanting to get glass containers to replace my plastic. I have never heard of the dirty dozen, luckily I try to buy those items organic when available anyway. I find it hard to find organic produce where I live. A lot of the time they just don’t have what I am looking for organic. Great advice for other ways for me to be eco-friendly at home. These are all great tips! Thank you! I really have been trying to work on this but it can be a struggle sometimes! I do feel good about most of the things you mentioned, though. I think I have checked most of these things off! So many great tips, I have to admit I only do some of these. But you have given me some great ideas and I definitely want to incorporate more of these in my home. I never even thought about the dishwashing and dishwasher soap, makes so much sense!! YES, I’m a big fan of farmers markets too! supporting your local economy, fresher ingredients, and less packaging waste! Absolutely! So many good reasons to go to the farmer’s markets and it just tastes better too. ahh i love this so much! I totally agree things taste better from a stainless steel straw! I bring mine with my everywhere! I’m happy to say we follow all of these in our house! That graphic is really helpful. Organic can be expensive and I’m never sure what I should be buying that way! Glad to hear! Yes, it definitely helps to have a guide and buy organic on the produce that matters. This is such a useful post, thanks. I was watching a program on tv yesterday and they were saying that washing the dirty dozen is not enough. I always thought a good rinse under the tap would wash away any nasty toxins but apparently not. And as all of my favourites are on this dirty dozen list, I think some changes need to be made. 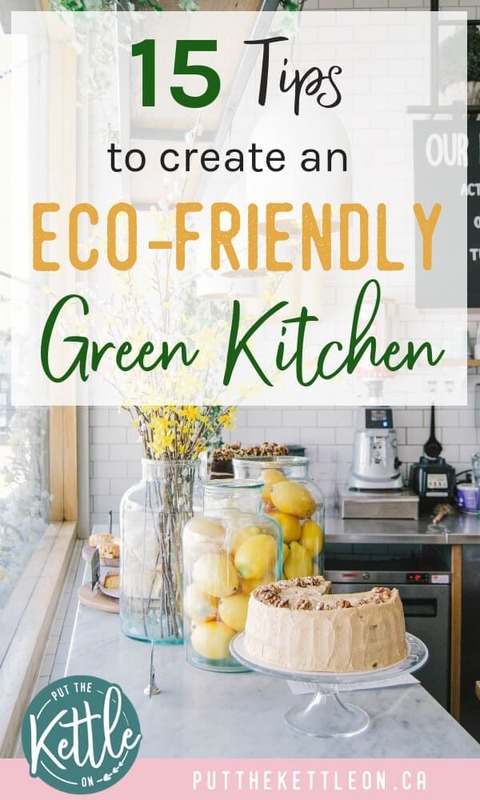 I’m quite a long way from having a green kitchen but these tips are really going to help me. Love this! So many great tips! I do a lot of this already but there’s always ways to improve. We compost and have our own garden so that helps too. We would love to raise our own chickens too. Thank you for putting this all together! Super helpful. If it helps, for tile and carpet cleaning, Chem-Dry doesn’t use toxic chemicals either! Hi Sarah! That’s great to know about the carpet clearer. Thanks for the tip!